Eleven Men Met This Fate Near Shenk's Ferry on Saturday. With a roar and a shock that were heard and felt miles away, and resulted from a cause that can only be guessed at, a dynamite factory in Bausman's Hollow, a mile east of Shenk's Ferry, blew up on Saturday afternoon, blowing eleven men to pieces and scattering the fragments all over the immediate neighborhood, injuring at the same time nine other men. A number of girls and women at work in one of the buildings escaped physical damage except shock and temporary deafness. Ernest Turner, Boyd Mills, Wayne County, aged 35 years. George Hathaway of Emporium, Pa. aged 19 years. Edward Holmes of Buffalo, N.Y., aged 27 years. Martin Rineer of Colemanville, father of the dead boys of the same name, right arm broken and badly cut and bruised. John Gephart of near Colemanville, struck by a rock in the breast and cut around the head. Henry Boatman, Benjamin Johnson, Charles Creamer, Abraham Schwartz, Jacob Shoff and Walter Bewets were more or less cut and bruised, but they were not seriously injured. Awful tale of the Awful Work of an Awful Explosive. The dynamite plant was the property of the G. R. McAbee Powder and Oil Company of Pittsburg. The superintendent in charge is Albert Rapp. For about years the plant has been turning out dynamite and at the time of the explosion it was filling a large order for the new McCall's Ferry dam. There were a number of buildings, in one of which was stored about two carloads of the deadly stuff that did not explode. The trees around about were torn and shattered by the explosion and deep holes mark the sites of the destroyed buildings. At the farm of Jacob Sigman, almost a half mile away, the barn was thrown out of plumb, and several windows were torn completely out of the house. Mr. Sigman said that when the explosion came his whole house inside was illuminated by a yellow color, which lasted almost a minute. At the house of Herman Gephart, not far from the factory, every window pane was broken, as were all the dishes. Mrs. Gephart was sewing and she was thrown to the floor. At Jacob Risser's, a half mile away, the windows were broken and the house and the dishes were all smashed. It was the same in other houses of the neighborhood, although those named were the closest, and in Colemanville the doors were opened by the shock and the windows rattled. The accident happened a few minutes before 1 o'clock. A watch, belonging to one of the dead men, showed the time to have been 12:42. 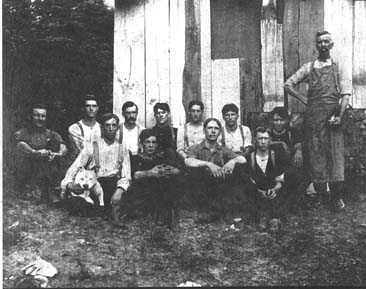 The men had nearly all returned to work, and in the punch house were the two Rineer brothers, Funk, Phares Shoff, Parker, John Boatman, Turner, Hathaway, Holmes and Myers. Frederick Rice was sitting in the doorway cutting paper. The men in the punch house were punching and casing the dynamite, of which there was about 2,500 pounds in the building. When the explosion came-and nobody knows or ever will know what caused it-the men were torn to pieces, while the building was blown to splinters. Pieces of timber were sent flying in all directions. Supt. Rapp was in his office making out the pay roll; the explosion caused him to jump through a window, taking sash and all with him, and he was followed by several others. In a few moments another explosion ocurred at the nitro-glycerine house, but it did not do much damage. Some men were unconscious for a short time. All around the grounds there is a little railroad which was operated by a horse that drew loaded cars with material, stock, etc., from one building to another. This horse was driven by a young man named Lee. He had just taken a car load of material to the punch house and then started in another direction to the shell house for a load of shells. While on the way the explosion occurred. The horse ran away, stepped over the side of the road bed and fell down an embankment into a creek, where he was found uninjured. In the shell house six young girls were at work: Flora Frank, Daisy Shoff, Nellie Warfel, Edna Rice, Esther Greiner and Edith Rineer, the last named being a sister of the two Rineers killed. Two little sisters of hers were also present, having brought dinner for their father, brothers and sister. All of the girls were knocked over, and many suffered from some time from the shock. people died in the explosion but we don't know which four. All Saturday afternoon and evening search for the bodies of the dead men was kept up. Pieces of flesh as small as a silver dollar and as large as a paper dollar were brought in, having been picked up in every direction. Small bones and pieces of flesh were gathered up until they filled three dynamite cases. One of those pieces was a foot and another a hand and arm to the elbow. On Sunday hundreds of visitors were about the place; many assisted in the search. A force of Italians from the Kerbaugh work found many fragments. An arm and other parts were identified as portions of the body of Frederick Rice, by his brother, who knew by a scar on the wrist that came from a cut several years ago. No One Really Knows What Brought About This Horror. Coroner Witmer, Deputy J.Z. Wade and Undertaker Zercher were on the grounds when it was decided to hold an investigation. A jury was sworn, composed of George Lawrence, A. J. Zercher, Frederick Shoff, Harry H. Hensel, Benjamin Beach and James Lungren. Supt. Albert Rapp testified that he was in his office when the explosion occurred. The building was terribly wrecked and he jumped out of the window, as did several other men who were with him. He knew nothing as to what caused the explosion, although it might have happened in many ways. George Gray testified that he was at the box house, where he was engineer. He could see into the punch house, and he saw J. Curtis Myers place one box of dynamite on top of another. As he did so Gray saw a spark come out as the two boxes touched each other-just such as a gasoline engine would send out. Grey knew little for some time afterwards, as he was struck by a stone. Several other witnesses who had been more or less injured in the explosion testified, but threw no light on the subject as to what caused the accident. None of them knew much, and nearly all said they were dazed for some time after the explosion. It is thought that some one of the employees handeled a case with less care than usual, and Myers may have been that man. It is likely that the real cause will remain a mystery, although there is no doubt that the management exercised the greatest care. Who They Were-Nearly All Lived in the Vicinity. Colemanville is the most distressed neighborhood in Lancaster county today. Martin Rineer is an industrious and respected man, and his two sons who perished in the explosion were good boys, members of a family of twelve children. The death of young Rice is particularly sad. He is a son of Louisa Rice, and leaves a wife and two children, one of the latter but two weeks old. Wm. Funk was a son of William Funk, and a boy of good reputation. Parker's father lives at Bridge Valley, and John Boatman was a son of Henry Boatman of Pequea, who was also employed at the dynamite plant. All three were mere boys. Phares Shoff was a son of Samuel Shoff of Colemanville. The Boatman family has been very unfortunate, as another son was killed on the railroad recently. Of the strangers Ernest Turner came from Wayne county. J. Curtis Myers was known by the hands as "Klondike." Gus Hathaway was a Swede and was called "Happy Hooligan". Ed Holmes was known as "Highspire," and his home formerly was in Buffalo, N.Y. They were all good workmen and made many friends. 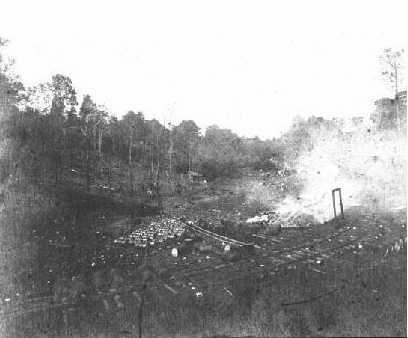 The Funerals of the Men Blown Up by Dynamite Held in Colemanville. On Tuesday at Colemanville the remains of the eleven victims were consigned to their graves. The services were held in the Methodist church, which could not hold one tenth of the people who gathered there. There were two funerals, the first that of Frederick Rice, and the other of the other ten victims. Rice's funeral was held in the morning. Services were conducted by Rev. J. H. Hunt, of the Safe Harbor M.E. church. Interment was in the cemetery adjoining the church. In the afternoon services over the remains of Phares Shoff, Benjamin Rineer, Joseph Rineer, William Funk, W. Collins Parker, John Boatman, J.C. Myers, Ernest Turner, George Hathaway and Edward Holmes were held in the same church. The fragments of the men were placed in one casket. The casket was not opened and services were conducted by Revs. Hunt, Groff and Behney. There were many floral offerings. Among the mourners from a distance were the mother and sister of Edward Holmes of Buffalo, N.Y.; the wife, sister and brother of J.C. Myers of York; the stepfather of George Hathaway of Emporium; the Bond brothers of New York, who had worked at the dynamite factory and who knew the men who were killed. At the conclusion of the services the casket was taken to the cemetery and placed in a grave beside that of Frederick Rice.